1. Cook cinnamon stick, cloves, and ginger in a Dutch oven over medium heat, stirring constantly, 2 to 3 minutes or until cinnamon is fragrant. 2. Gradually stir in juices. Bring to a boil over medium-high heat; reduce heat to medium-low, and simmer 15 minutes. Pour mixture through a wire-mesh strainer into a heat-proof pitcher; discard solids. Serve warm. Garnish, if desired. Note: For testing purposes only, we used POM Wonderful 100% Pomegranate Juice and Welch's 100% White Grape Juice. 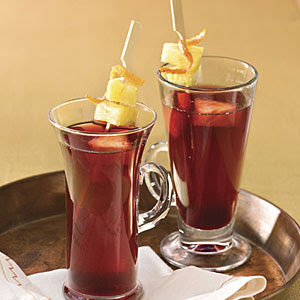 Tipsy Hot Spiced Pomegranate Sipper: Prepare recipe as directed. Stir in 1 1/4 cups almond liqueur just before serving. Makes 9 1/4 cups. Cold Spiced Pomegranate Sipper: Prepare recipe as directed. Let stand 30 minutes. Cover and chill 2 hours. Store in refrigerator up to 2 days. Stir and serve over ice. Prep: 10 min., Cook: 25 min., Stand: 30 min., Chill: 2 hr. Fizzy Spiced Pomegranate Sipper: Prepare Cold Spiced Pomegranate Sipper as directed. Stir in 1 (33.8-oz.) bottle ginger ale just before serving. Makes 16 cups.